The surprisingly small size and lightweight of the LS9-16 make it a perfect choice for applications that require maximum portability and handling ease. Use it for events or temporary live sound setups, and benefit from the power and performance of much larger and more complex systems in an eminently portable package that can be set up and operated anywhere with ease. The LS9-16 can be rack-mounted using an optional rack-mounting kit for optimum integration with any system. 16 top-performance recallable head amplifiers deliver microphone and line sources with extraordinary presence and realism. An additional 16 channels of processing power ready to receive audio via the Mini-YGDAI expansion slots, providing a total of 32 channels! The LS9-16 make immense digital processing power and control flexibility available via an interface that will quickly become comfortable and convenient for the first-time user. 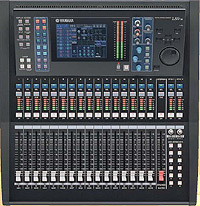 Anyone who has ever used a Yamaha digital console before will feel right at home. Fader levels are directly controlled via precision 100-millimetre motor faders for instant hands-on access. Corresponding illuminated switches are provided for channel on/off switching and cueing, and independent LED level meters let you keep an eye on channel signal levels. Yamaha's acclaimed Selected Channel interface provides efficient access to other channel functions via an ingenious integration of physical controllers and a large colour LCD panel. Deeper functions and system settings can be efficiently accessed via the console's "Display Access" keys and programmed via the LCD display and data entry controls. A "Home" key brings you right back to the main operating mode no matter where you are, so you need never be lost in menus. You might simply want to prevent "accidents" during critical live performances, or limit access to specific functions in order to minimize the need for direct supervision of inexperienced operators. You may have spent hours with an analyser setting up the EQ to precisely tune the system for a room, for example, in which case you won't want those settings changed under any circumstances. Access management provides a flexible means of preventing unauthorized access to the console, or restricting access to a limited set of functions. User access can be controlled either via passwords or USB memory keys. The administrator can assign specific functions to each unique password or key, so the user only has to log onto the console with the assigned password or insert the USB key to begin operation at the assigned level. USB memory keys can be easily created either directly via the console or a computer running the LS9 Editor applications software. As an added bonus the same USB memory key used for access can also be used to store the user's scenes and other preferences. The LS9-16 has one expansion slot on the rear panel. The expansion slots accept a wide range of optional Yamaha and third party Mini-YGDAI I/O cards that can be used to add analogue or digital input and output capability in a range of formats. You can even use Mini- YGDAI cards to bus-cascade with other consoles for significantly expanded input capacity. In addition to the analogue inputs and outputs and expansion slots, the LS9-16 rear-panels feature MIDI terminals, word clock input and output connectors that allow full word sync with other digital audio gear, S/PDIF format digital 2-track inputs and outputs, and an Ethernet network connector. The amount of signal processing power packed into the LS9 consoles is really quite impressive when looked at from the perspective of a comparable analogue system. Here's an example: if you wanted to replace a fully loaded LS9-16 with analogue gear you'd need a 16-channel console plus some racks loaded with 16 gates each, some racks loaded with 16 compressors each, another rack containing four GEQ units and four signal processors for effects, and perhaps yet another rack containing your CD player and recording gear. And what a wiring and patching nightmare! When you consider that you get all of this and more in a compact console that a single person can pick up and move around without breaking into a sweat, the choice is obvious. One of the reasons the LS9 consoles are so compact - and another reason you'll want to go digital - is that a total of 17 physical faders on the LS9-16, give you fast, easy access to all input channel, mix bus, matrix, and master levels. On both consoles the input channels are available in two fully patchable layers: 1~16 and 17~32 on the LS9-16. And you can switch between layers instantly by tapping a single dedicated button. You can organize your inputs so that channels you'll want to operate most of the time are in the "top" layer, or you can "vertically" link input channels across the two layers for stereo operation. Of course you can link channels "horizontally" in the same layer if you like, but pairing vertically keeps controls you don't need to operate out of the way. You can even "Y-split" channels to appear in both layers and have a monitor and a FOH layer. There's also a "Master" layer button that brings all 16 mix bus levels to the console's faders on the LS9-16. In addition to the two input channel layers and master layer, the LS9 consoles feature a "Custom Fader" layer to which you can assign any combination of input and output channel faders your application requires. Stereo inputs are handled in a similar way on the LS9-16, with two stereo inputs on each of the input layers. The LS9-16 provides 16 analogue inputs built-in. Additional inputs can be provided via the LS-9-16's single rear-panel Mini-YGDAI expansion slot. The 16 mix buses can function as any combination of 16 auxiliary sends or sub-groups. That's a lot of AUX knobs and/or faders. However on the LS9 consoles the mix bus levels are controlled via the "1-16, 17-32 fader layer with the simple Sends on Fader function. Just touch the "Master" button and faders 1 through 16 directly control the mix bus levels. Each of the mix buses can be easily assigned for mono or stereo operation. You can also choose the send point to be pre or post fader, and when it's pre-fader you can even select the send point to be pre or post EQ and dynamics. But don't worry about the choices because Yamaha provides an easily recalled default setup scene that lets you get mixing straight out of the box. The LS9 also features an 8-bus matrix that can be used to provide additional outputs whenever they are needed. The matrix can receive signals from output groups so it can be used to create extra monitor mixes or used for different level and EQ setting in a distributed PA system. And for main output both models have a stereo bus and a mono bus that can either be used independently or in LCR mode with proper LCR pan control. Outputs can be patched to any of eight analogue "Omni" outputs on the LS9-16. Additional outputs can be provided via the rear-panel Mini-YGDAI expansion slots - one slot on the LS9-16. There's a very good reason that Yamaha digital effects are highly regarded in the professional sound field: they are simply the best there is. In the LS9-16 you have an extensive range of top-quality effects - from ambience and echo to modulation and distortion - that you can access and add to the mix when and wherever needed. For direct hands-on control you can adjust individual bands from the console's faders in much the same way as you'd adjust the EQ bands on an external GEQ unit. With the LS9 -16 you need to select the group of faders to adjust. Another convenient-control feature is the ability to instantly reset any band to nominal simply by pressing the corresponding fader's [ON] key. Most live-sound systems include a CD player and/or recorder of some sort to provide background music and allow recording of the program for reference purposes. That's one or two more pieces of external equipment that won't be required with an LS9 console. The LS9-16 features a built-in USB Memory Recorder/Player that works with USB memory sticks plugged into the console's USB port. You can record MP3files and play back MP3, AAC, and WMA files at 96, 128, or 192 kbps. You can even cue playback of specific files from the console's User Defined Keys!